Today is St Piran's Day. Patron saint of Cornwall and patron saint of tin-miners, his flag is the flag of Cornwall and his day is celebrated widely throughout the Cornish world. But who was St Piran? The collection of legends suggest that he was born in Ireland in the sixth century, lived there as a hermit and performed many miraculous deeds, and became the target of a number of tribal kings who were jealous of his influence. They proceeded to get rid of him by throwing him off a cliff tied to a millstone, but Piran and the millstone arrived intact on the Cornish coast where the saint built a chapel in the dunes and began preaching. His fame spread around Cornwall and many places and churches bear his name and place where he made his Cornish landfall became known as Perranporth. Historically, little if any of this is verifiable. Piran has been identified with the Irish saint Ciaran of Saigir, who founded the monastery at Seir-Kieran in County Offaly and was one of the Twelve Apostles of Ireland, monastic saints of the sixth century (Celtic languages regularly alternate p and k sounds). The 14th century Life of Saint Piran, probably written at Exeter Cathedral, is a copy of an earlier Middle Irish life of Saint Ciaran of Saighir, but adapted to cover Piran's work in Cornwall. However other scholars have suggested that Piran might instead be identified with Saint Ciaran of Clonmacnoise, who founded the monastery of Clonmacnoise (also in County Offaly), and whose father was a Cornishman (though this saint is supposed to have died of yellow fever at the age of 32 and been buried at Clonmacnoise). Yet others present evidence for Piran having been a Welshman from Glamorgan. The St Piran Trust favours the Ciaran of Saighir identity. There is very little to go on, but Piran does seem to fit into the tradition of wandering Celtic and Irish monks, as well as the procession of saints who are said to have migrated from Ireland and Wales into Devon and Cornwall, many leaving only their names behind: Selus, Germoe, Gwithian, Levan, and Sennen, to name but a few. The millstone part of the story is a puzzle on its own. Execution by drowning tied to a millstone was a method of capital punishment sometimes used by the Romans; it is referred to in the Bible in St Matthew' Gospel, chapter 18 verse 6, and is associated with crimes, or sins, against children – worrying in connection with a holy saint. And what is the significance of the millstone floating to Cornwall? Could this be a confusion of some kind? Cornwall contains many stone pillars with engravings of the saints on them, like the one of St Selus in St Just church – might this be St Piran's 'millstone', but of Cornish, not Irish origin? The tin mining story is also unfathomable. Piran is credited with the 'discovery' of tin-smelting (though tinning had been carried out in Cornwall for centuries beforehand). A black stone on Piran's fireplace accidentally overheated, giving out a white liquid – tin. 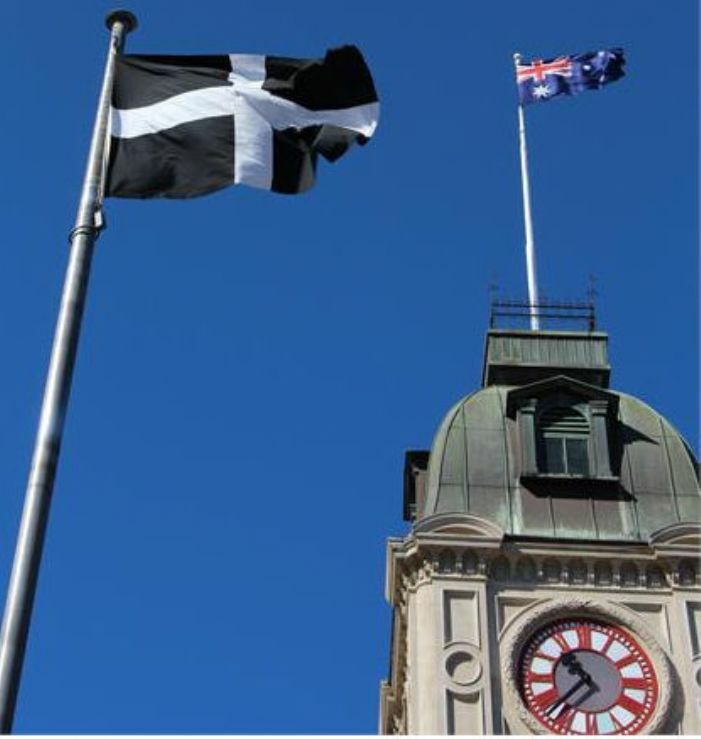 He shared this knowledge with the local people and thus provided them with both their own industry, and also their own flag: the white hot tin on the black ore in the shape of a cross; the light of truth shining in the darkness referencing the Celtic Christianity Piran brought to Cornwall. He seems a friendly saint – generous with his industrial discovery; good with animals, like St Francis (the legends mention his first congregation as being a fox, a badger, and a boar); and he has one more endearing characteristic: he was fond of a drink. The expression 'as drunk as a Perraner' has lasted down the ages and may apply to those who celebrate his feast day. Maybe St Piran's story tells us more about what it is to be Cornish than it does about the man himself?